Asaki is a BEMANI artist who made his debut in 2002 in GUITARFREAKS 7thMIX & drummania 6thMIX. 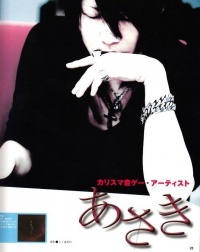 He is best known for his songs in the GuitarFreaks & DrumMania, which combine elements of rock, visual kei, and industrial rock in them, most of them he performed and produced solo, with some exceptions. Asaki has also been a large contributor to pop'n music and REFLEC BEAT, and even has done a few beatmania IIDX songs. He has also served as the guitarist for many other BEMANI artists, including wac, TOMOSUKE, and Yuei Uematsu. Despite being with KONAMI since 2002, though, very little is known about Asaki. His real name has never been revealed, he almost never makes appearances in BEMANI events, and very few pictures of him are on the Internet, most of them covering his face. Even the lyrics to his songs are affected by this; most only contain a part (if any at all) of the lyrics in the BEMANI OST booklets they correspond to. It is known, though, that he was the vocalist for a visual kei band called Blanc Neige (group pic here) prior to joining KONAMI back in his middle school years, though. Compared to most other BEMANI musicians, Asaki is one of the most reclusive. Asaki sound directed GuitarFreaks V5 & DrumMania V5 Rock to Infinity and GuitarFreaks V6 & DrumMania V6 BLAZING!!!!. Asaki is the only BEMANI artist that provided songs (new, newly arranged/sung or lyrics) for every single installment of REFLEC BEAT up to VOLZZA 2 (including updated versions and REFLEC BEAT plus). Lyrics for Asaki's songs tend to not be fully written on their original soundtrack booklets, either containing fragments of the song's lyrics, containing parts not heard in the song, translated (most frequent in songs with English lyrics), or not listed at all at his request. Asaki co-hosted the ceased BEMANI Backstage radio show. Asaki showed himself at the 101st BEMANI生放送(仮) (BEMANI Namahousou (kari)) episode, one of the very few appearance he's ever made at a KONAMI event. After the video was set to private for a week, Asaki's face in the episode is now censored. Asaki is one of the very few in-house artists whose songs have not been remixed or arranged by other artists. Asaki said that he joined KONAMI to get money to buy an amplifier, and that he found KONAMI after playing their RPG games, according to a 4Gamer interview. On the same interview, Asaki said that he writes the lyrics before composing a song. He also composes the long version of the song before recreating the game size version. Asaki is speculated to be Anonymous.